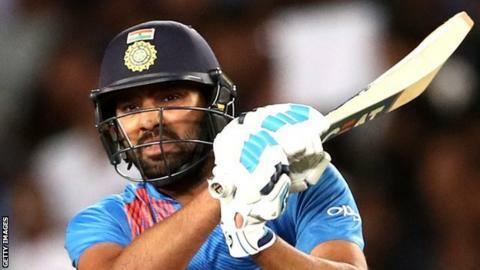 Rohit Sharma became the highest run-scorer in Twenty20 internationals as India beat New Zealand to level the three-match series at 1-1. The opener, 31, hit 50 off 29 balls as India chased 159 to win by seven wickets with seven balls to spare in Auckland. He now has 2,288 runs, surpassing New Zealand’s Martin Guptill’s 2,272. Rohit, who made his T20 debut for India against England in 2007, averages 32.68 from 92 matches. He has scored four centuries and 16 fifties, with a strike-rate of 138.41. New Zealand’s Suzie Bates is the leading scorer in women’s T20 internationals with 3,076 runs at an average of 30.76 in 110 matches. Krunal Pandya took 3-28 to help restrict New Zealand to 158-8, which featured 50 from Colin de Grandhomme, his maiden T20 half-century. Rohit, stand-in captain for the series as skipper Virat Kohli is being rested, shared an opening stand of 79 with Shikhar Dhawan in India’s reply. Although both fell in quick succession, Rishabh Pant made an unbeaten 40 off 28 balls and MS Dhoni 20 not out to seal a comfortable victory. “I’m very pleased with how we bowled and then we were quite clinical with the bat as well,” said Rohit. “We were expecting a performance like that. We’ve got quality in our side but we didn’t execute our plans in the first game. India, who won the one-day series 4-1, lost the first T20 by 80 runs, their heaviest defeat in that format. The final T20 is in Hamilton on Sunday.